You asked, we’re making it happen! This year we’re offering a limited-edition t-shirt just for benefit sale attendees: in adult, child, and doll sizes. Please note, you must pick up your shirt at the 2019 Benefit Sale, we cannot mail shirts. Order soon, as quantities are limited! Pre-orders for t-shirts will run April 1–30, 2019. A small number of shirts may be available for walk-up purchase on-site at the sale, but these will be first-come, first-served, and may sell out quickly. Place your order now to make sure you will receive your commemorative shirts! Quantities of the doll shirts are currently limited and may sell out! If they are sold out you may place yourself on our wait-list to have first dibs if we are able to reopen ordering. Please note that all t-shirt orders are nonrefundable. 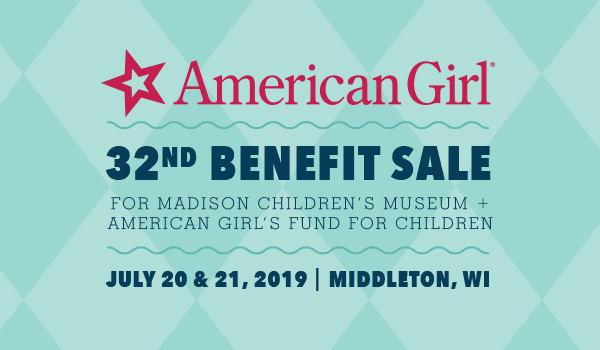 You must pick up your order in-person at the 2019 American Girl Benefit Sale on July 20 or 21, in Middleton, Wisconsin. We cannot mail or ship shirts. If you are not able to be present to pick up your shirts, you may have a friend attending the sale pick them up for you. You will receive a pick-up email with your unique order number shortly before the sale; make sure to forward that email to the person who will pick up your shirts. In keeping with our values of providing you with quality products at an affordable price benefiting a good cause, these limited-edition t-shirts are designed to be high-quality keepsakes. All the shirts are screen printed by a local company. The colors are pink and shimmery teal. 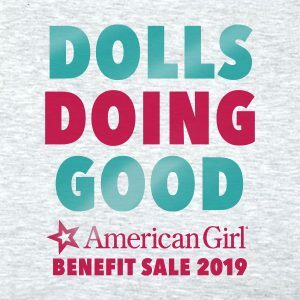 Doll shirts are provided by American Girl, printed by the benefit sale, and will fit all 18″ American Girl Dolls (including BeForever, Truly Me, or Contemporary Characters). 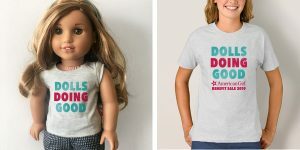 The design on the doll shirt is slightly different from the full-sized child and adult shirts, as shown above. Please note that only a limited number of doll shirts are available. Child-sized shirts are 90% cotton, 10% polyester, in a semi-fitted “princess” cut. Sizes are child XS – XL. Adult-sized shirts are 90% cotton, 10% polyester, in a unisex cut. Sizes are adult XS – 4XL. Extended sizes (2XL-4XL) are priced to cover a portion of additional production costs.